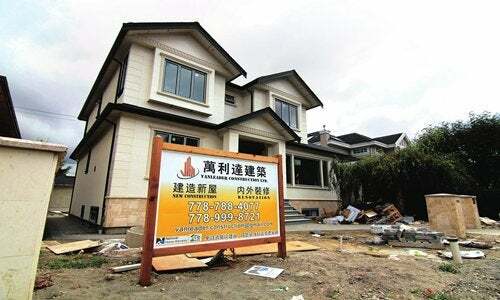 Above is a photo of a contractor's sign which stands outside a house currently under construction in a Vancouver neighbourhood popular with Chinese buyers. Plenty of key property markets in Vancouver and Toronto, which have been struggling, could be the next casualties as the diplomatic spat between China and Canada that broke out because of an arrest of a Huawei executive keeps intensifying. A department head of the Canada branch business of a top real estate agency in China told the Global Times that in the condition of anonymity that the agency canceled some Canadian promotional events and have encouraged new potential Chinese investors to begin to change their destinations for moving, or delay their investment plans. The sales of homes in greater Vancouver have dropped 42.5 percent in November, compared with the same month a year, earlier according to the local real estate board. For more detailed information about this feel free to contact me at my phone number at 778.888.8888 or email me at matt@mattgul.com.